In our classroom it’s OK to make a mistake, it’s all about taking a risk and having a go. Sometimes the mistakes we make can lead to new twists in learning. This is a story of how an easy to make mistake was turned into an exciting child initiated learning opportunity and the creation of a much loved resource in our classroom. 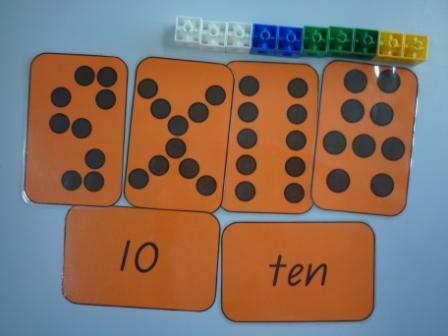 Subitising in Early Maths Understandings is a skill that requires children to accurately guess a small number of objects (up to 5) in a random order ie. not in a pattern or rows or groupings. The national curriculum also requires the children to read, not only the numerals but also the number words and so I had made a set of counting cards(mine were up to 10) incorporating all of these concepts. We were playing a counting and sorting game with the cards, when I noticed that some of the cards had been sorted inaccurately. 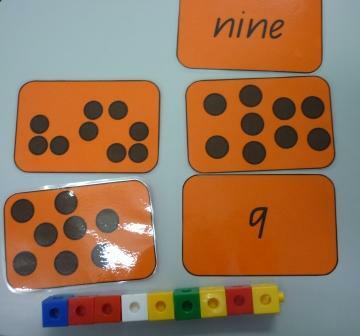 I asked the children if they could find the odd one out in the grouping and all the children quickly began to count the dots and work it out. They loved this new twist on the game and they spent a lot of time challenging each other to find “the odd one out” in the new groups they made. To make a permanent record of these groupings the children photographed them. There are 2 cards that don't belong in this picture. One of these cards is not like the others! I Spy books are some of our favourites and we have created a few of them this year. The children decided to use their photos to make an I Spy the Odd One Out counting book. I mounted and laminated their printed pictures and placed them in a display folder. The children designed a cover and this book has become another favourite on our book shelf. My initial plan for the use of the cards and the counting of concrete objects, turned into an experience far more valuable and long lasting, thus enabling mastery, thanks to my preppies taking control and negotiating the learning for themselves.